Marcia was featured as the lead article on the magazine section of the Sunday edition of the Canandaigua Daily Messenger. Clicking on the picture will bring the narrative into focus. The article continues with a second photo of Marcia and husband, Bill. The title of today's blog is derivative of the good-natured ribbing Marcia takes from her quilting friends as publicity seems to follow her around! Paper whites always add winter delight to any room. A left click will bring into view a painting of a Massachusetts seaside in winter. It was a gift from Bill's great aunt who often painted in this area. She worked in both water colors and oils. The Christmas cactus stays true to the season as it blooms again. We have had it for several years, and it was orginally a gift from our friend, Dorothy Schriver. Priscilla is working on a new jacket . The pattern is the Wild Onion, where the jacket is constructed all in one piece. The red and blue plaid fabric is the flannel base on which Priscilla is building the jacket. Priscilla has scrunched and then embellished the blue fabric on the left with thread work. The se are strip sets of fabric that Priscilla has constructed by interspersing plain silks with patterned cottons. This is the back of the jacket with the fabrics that are being auditioned for it. This picture is for our friend Pat Pauly who said she's been envisioning the horses in the snow. We had a few flurries this morning, and while the horses could have been in their stalls, they chose to come outside to watch the snowfall. Wow! I was nominated for the Kreativ Blogger award by my friend, Jeanne Beck, who writes so wonderfully about her art-full life. Be sure to check out her blog! Lots of color and lots to see, whether Mel is quilting, knitting, painting, home decorating, or enjoying her new country property. Wearable artist and art quilter, Priscilla is also a world traveler who searches the foreign markets for wonderful fabrics and specialty items for embellishing our garments and quilts. I haven't met her, but this artist does wonderful work and shares her thoughts on the creative process. Marcia makes beautiful hand-dyed and designed fabrics and creates wearable art with her fabrics. Several of my friends and I have been fortunate to acquire some of her fabrics and clothing items. Beth is our "go-to" person for all things to do with fabric dyeing. Check out her blog for great information on fabric dyeing, including marbling and shibori. She also has great pictures of her favorite birds, shells, and flowers. 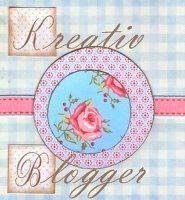 I enjoy these blogs, along with several others, and feel very fortunate to have such great inspiration at my fingertips! The Canandaigua Daily Messenger newspaper asked Marcia to come to Auburn to pose for pictures with her quilts that are hanging at the Schweinfurth Museum. We'll be watching this Sunday's edition to see what's included... !! P hoto Editor/Photographer and RIT graduate, Rikki VanCamp met us there and was the director of the project. Ma rcia was placed in various positions near her larger work, Jet Trails #6, which is near the entrance to the main display area. Rikki captured many photographs of Marcia (including this one from a chair!). Marcia's other quilt (Jet Trails) is displayed in an adjacent room on the wall to the right of the seated and posed artist. We look forward to seeing the result of Rikki's work, and Marcia is pleased and honored to have been selected by the newspaper for this feature! This is Blocks #5, which has been selected for exhibition in the 2009 Form Not Function: Quilt Art at the Carnegie. The Carnegie Center for Art & History is in New Albany, IN, and the show runs from January 9 through March 7. The quilt is 28 x 62 and was quilted with 12-weight varigated thread. The shipping of quilts is part of the process for the practicing artist. When the rolled quilt won't fit the box and folding become necessary, bubble wrap helps keep wrinkles at a minimum. It also helps to fold the quilt with the front folded outside. The label at the lower left identifies the work and the artist. The folded quilt is ready for sealing in plastic to protect it from moisture and dirt. A spreadsheet keeps track of where various quilts are being displayed and also contains deadlines for submissions for future shows. The hanging rod completes the packaging. UPS provides online service, including printing of both the sending and return labels, as well as scheduling next-day pickup (in case you wondered for another reason -- along with email -- why the US Post Office has a $1.5 billion deficit this year! ).